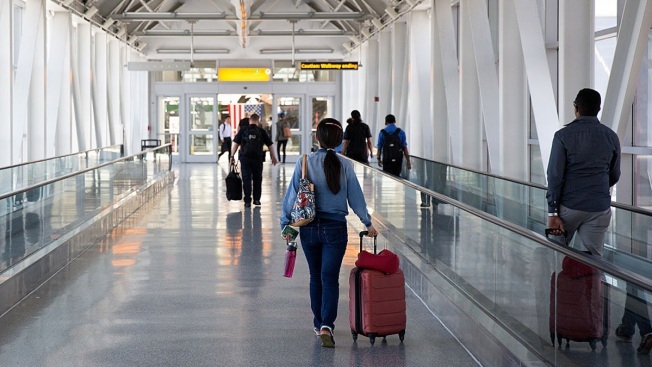 in this file photo, people walk toward the departures terminal at John F. Kennedy International Airport, June 30, 2016 in the Queens borough of New York City. State Department is warning Americans living in and traveling to Europe of the ongoing threat of terrorist attacks on the continent through the summer. In a new travel alert issued on Monday, the department said ISIS, al-Qaeda and their affiliates retain the "ability and to plan and execute" attacks in Europe. It said the U.S. officials remain concerned about the potential for future attacks, following a series of strikes in France, Russia, Sweden and Britain. The alert said U.S. citizens should be especially vigilant at large, high profile events, particularly during the summer travel season. The department's last terror alert for Europe was issued on November 21 last year and expired on February 20. Monday's alert expires on September 1.